Good morning. Well the sun is out, but there is a nip in the air, so it seems a good day to get tucked away in the craft room.........any excuse really!!!. 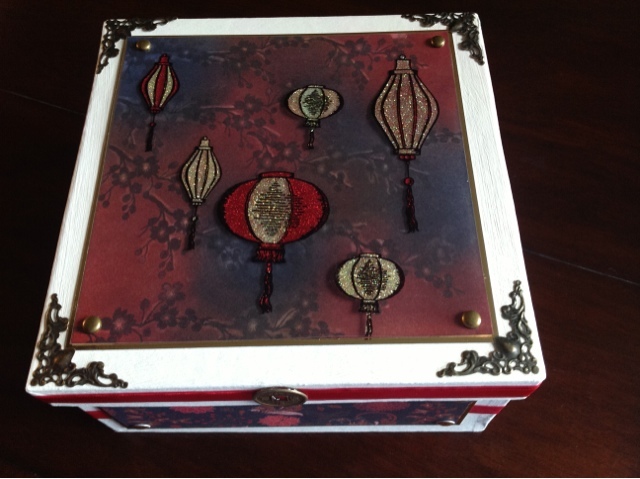 Anyhow, I thought I would share another of my samples for Sheena's new oriental range. Yes, it's a box again. You know I love making boxes, but this is the first time i have used acetate on one. It was quite a simple one, as the papers I used on the side (from Sheena) were quite busy anyway, and I didn't want to loose the effect of them. (Sorry photos are not the best). The paper mâché box is painted in emulsion, all 4 side a mat and layered with gold mirror card and the papers, with ribbon tucked behind. Gold card candy were in each of the corners. For the lid, centura pearl was distressed with fired brick, faded jeans and brushed corduroy (using the colours from the paper), and blended. Using one of the branch stamps, I stamped multiple times using Stayzon. Once I was happy, I then faux bleached some area, just by taking a damp brush and removing some of the distress ink. This adds shade to the image and lightens areas ( my favourite technique at the moment). I then stamped some lanterns onto heat resistant acetate, embossed and added glitter to them. Once dry I turned the acetate over and used brads to attach to the faux bleached background. Some ribbon was added to the outside of the lid, and some embellishments added to the ribbon and corners of the lid. I hope you like it and get to see this and all the other Inkoids fantastic samples on Create and Craft over the weekend. 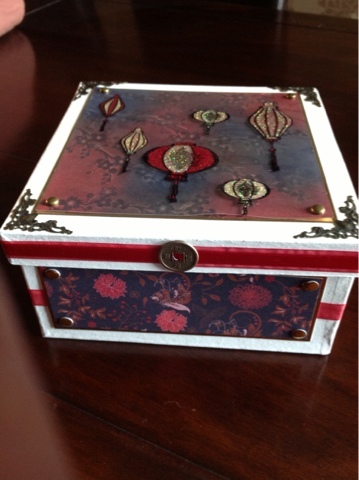 This is great, Caroline, I always love the boxes you make! You are so good at making boxes, Caroline, I need lessons from you. This is a stunner.